A Short Arm Hex Key is a six-sided shaped bar bent at a 90 deg angle on one end. Short Arm Hex Keys are obviously shorter than a long arm hex key and are designed to be inserted into a like-sized hollow recess of a socket cap screw to manually tighten or loosen the fastener. 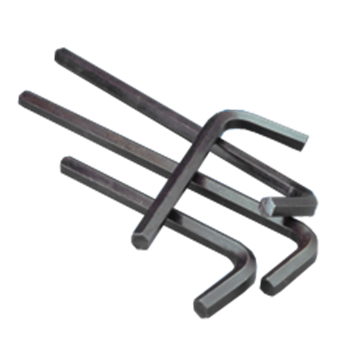 Short arm hex keys are made from hardened alloy steel are are stocked in 6150 Crv and 8650 alloy in both imperial and metric sizes. See the spec below or our fastener spec section for more details.